For more information about the Minor in German, please contact Dr. Emma Woelk. Germany has Europe's largest economy. Germany ranks #1 in the world for financial support to foreign students. German companies employ almost 1 million Americans. German is the 2nd most common scientific language. German is the language of some of the most influential writers, thinkers, artists and scientists in the Western world. German courses at St. Edward's are designed to help students reach linguistic and cultural proficiency. We offer all levels of language courses in addition to courses on the rich culture and tumultuous history of the German-speaking world. The German curriculum promotes language learning, intercultural proficiency, and critical thinking and writing skills. These skills can open up exciting opportunities for students and graduates in the financial, medical and educational fields, to name only a few. This makes the German Minor minor an excellent complement to any major. The German Minor consists of 18 credit hours. You'll find more detailed information below. 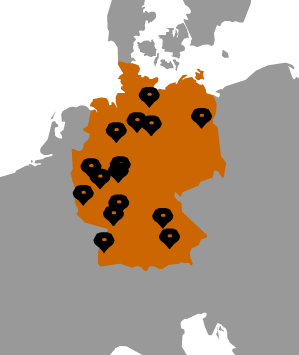 The German Minor is part of the Department of Languages, Literatures, and Cultures. Students interested in German at St. Edward's can count on plenty of activities right here in Austin as well as a wide variety of study abroad programs. Please visit the Deutschklub (German Club) homepage to find out more about what's going on on campus. St. Edward's students have plenty of choice when it comes to study abroad. With partner universities and approved provider programs all over the world, everyone can find what they're looking for. Use this site to help narrow down your search and see what's available in Germany, Austria and Switzerland. St. Edward's has an impressive track record of successful Fulbright applicants. Many of these students received grants to teach or conduct research in Germany. In fact, German awards more Fulbrights to U.S. students than any other country on earth! Students in STEM fields will find no shortage of opportunties to work and study in Germany before and after graduation. For example, the German Academic Exchange Service offers funding for students and recent graduates to condunct paid Research Internships in Science and Engineering every year. The Congress-Bundestag Youth Exchange (CBYX) for Young Professionals provides 75 scholarships each year to young adults wishing to improve their German and intern in a setting directly related to their career field. The elective classes above include Business German, internships, conversation courses, and courses on literature and culture! You can earn credit abroad!